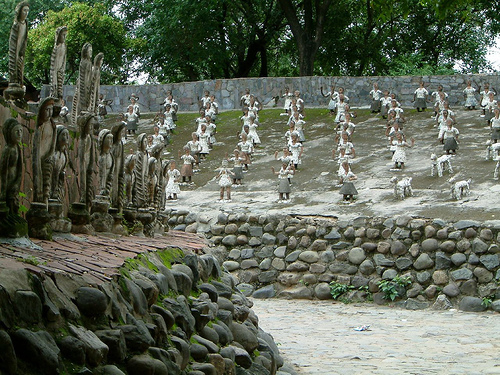 Nek Chand began creating his amazing rock garden as long ago as the 1950’s using urban and industrial waste. This illustrates that using recycled materials is not quite such a new concept after all. 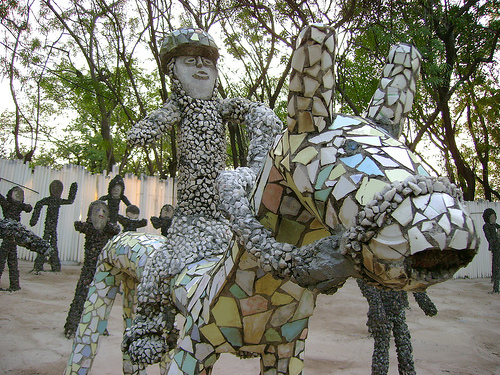 Chand used anything he could lay his hands on to create a strange new world of animal and human figures at Chandigarh. The art world cannot decide whether Nek Chand is a recycling genius or just a mosaic artist with a touch of OCD. Chand purposely set out to show that the enormous waste generated by humans could be put to good use. Rather than seeing everything as disposable trash he wanted to see what he could create from it and his Rock Garden has become something of a personal crusade. Chandigarh is situated near the foothills of the Shivalik range of the Himalayas in Northwest India. Chandigarh serves as the capital of two states, Punjab and Haryana, and is a union territory of India. Chand’s project began when he worked as a transport official and started spending his free time clearing a small patch of jungle to convert to a garden area. That garden area has now expanded to over eighteen acres adorned with several thousand sculptures set in large mosaic courtyards. It has attracted around 12 million visitors at the astonishing rate of around 5000 per day. 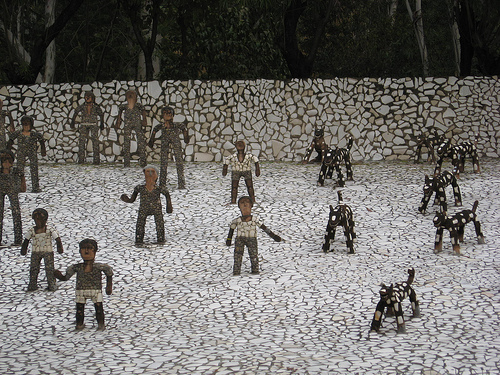 Chand’s figures are made from a huge variety of materials. Over the years he has discarded metal, stones, bricks, broken pottery, broken china, tree trunks, rags, plastic dolls and bottles. Some of the more unusual items that have taken on a new life in his rock garden old shoes, light bulbs, car tires, rusty bicycles and even birds’ nests! The best definition for this art form is picassiette, a french term meaning “stolen from plate”. Any combination of discarded objects can be used and the rest is up to the artist’s imagination. 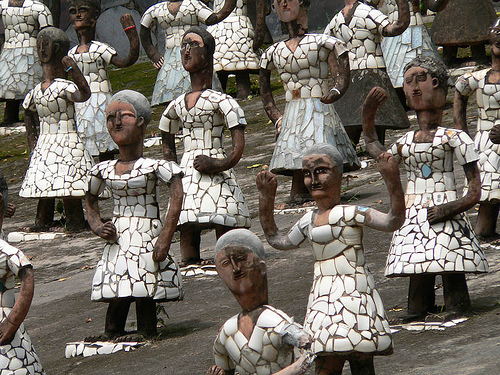 In the case of Nek Chand, there are no limits! 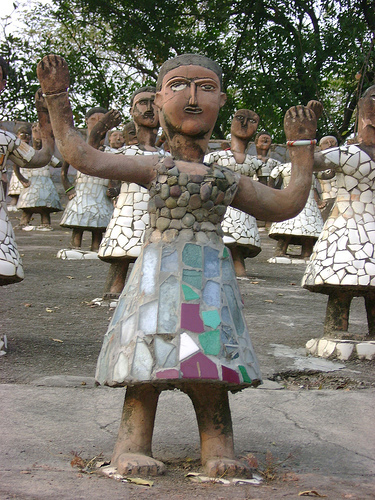 This entry was posted in Uncategorized and tagged Chandigarh, Mosaic, Mosaic artist, Nek Chand, sculptor, sculpture. Bookmark the permalink.